After the recent announcement of the Vatican TV station, I was thinking the Vatican should venture out into movies. Here are a few of the suggested titles. The story of a Man who has an extraordinary liturgical encounter while accidently sitting on the first row, which becomes life changing for not only himself but those around him too. Follow the misadventures of two skateboarding teens as they are sent on a journey by the local parish priest which proves to be the key and calling from God as they encounter and discover the Liturgy. 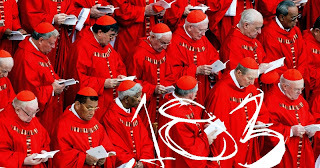 Watch 183 angry men battle it out as they elect a new pontiff: conspiracy and treachery galore. Three unspecting priests get assigned to the rogue parish of their diocese better known for its abuses than its uses. Their only means of survival: sticking together. Is it God's Will or just mere chance as they set about trying to thwart the evil liturgist Mrs. Mann Hans?